The Book Of Revelation (properly known as “The Revelation Of JESUS CHRIST”) is written with many symbols and metaphors that imprint a deeper understanding into the minds of those with eyes to see and ears to hear. Within this book are described two beasts which represent governmental systems and one beast representing the leader of those systems. In nature, you will notice that GOD does not create multi headed creatures. GOD does everything in a natural way. Although multi headed creatures do exist, they seldom, if ever have more than two heads and are the result of a mutation. This beast in Revelation 13:1 is a governmental system. Also, this beast is on earth and rises up out of the sea at the end of days. The sea is a sea of people. This sea of people is supposed to be the Bride of CHRIST, but due to their lack of knowledge of GOD’S WORD they are deceived into worshiping the devil, which is the false CHRIST. Because of the people’s lack of love for the TRUTH, they become the bride of satan and are known as the great whore that sits upon many waters. So this beast rises up out of the people. It is the governmental system of the end time. The One World System. Notice in the verses below, that "not the spot of HIS children" in Deuteronomy 32:5 below, and the phrase (“the spot of HIS children”) meaning "sons" as in family name, says that "their spot" has to mean the only other possibility, which would mean the devil's children. Meaning that they are not HIS children, therefore they must be satan’s children because there are only two choices. Deuteronomy 32:5 They have corrupted themselves, their spot is not the spot of his children: H1121 they are a perverse and crooked generation. From H1129; a son (as a builder of the family name), in the widest sense (of literal and figurative relationship, including grandson, subject, nation, quality or condition, etc., (like H1, H251, etc. ): + afflicted, age, [Ahoh] [Ammon] [Hachmon] [Lev]ite, [anoint]ed one, appointed to, (+) arrow, [Assyr] [Babylon] [Egypt] [Grec]ian, one born, bough, branch, breed, + (young) bullock, + (young) calf, X came up in, child, colt, X common, X corn, daughter, X of first, + firstborn, foal, + very fruitful, + postage, X in, + kid, + lamb, (+) man, meet, + mighty, + nephew, old, (+) people, + rebel, + robber, X servant born, X soldier, son, + spark, + steward, + stranger, X surely, them of, + tumultuous one, + valiant[est], whelp, worthy, young (one), youth. Notice in verse Deuteronomy 32:6 below that GOD is now talking to HIS children and asking them: Do you “thus”, which means “in like manner”, meaning in the same manner as “their spot” or satan’s children in Deuteronomy 32:5 do. GOD is asking this with reference to Deuteronomy 32:5 where HE says that their spot is a perverse and crooked generation. Deuteronomy 32:6 Do ye thus H2063 requite H1580 the LORD, O foolish people and unwise? is not he thy father that hath bought thee? hath he not made thee, and established thee? That is to say; Do you likewise treat the LORD as satan’s children do, O foolish people and unwise? is not he thy father that hath bought thee? hath he not made thee, and established thee? Irregular feminine of H2089; this (often used adverbially): hereby (in, with), it, likewise, the one (other, same), she, so (much), such (deed), that, therefore, these, this (thing), thus. A primitive root; to treat a person (well or ill), that is, benefit or requite; by implication (of toil) to ripen, that is, (specifically) to wean: bestow on, deal bountifully, do (good), recompense, requite, reward, ripen, + serve, wean, yield. The leopard, which cannot change his spots are likened unto satan’s children, and this is what the beast is likened unto. If you look at Ezekiel 38 and 39, you will see that the chief prince, which is Russia (Esau), comes against Israel in the latter days. This happens at the battle of HamonGog. Watch the video: “The Battle Of HamonGog” for detailed information on this subject. The mouth of this beast is the mouth of a lion. The symbol of Judah, which are the true Jews is the Lion. The mouth of this beast, those that control, is the false lion, it is the mouth of those who say they are Jews and are not, but do lie and are actually of the synagogue of satan. See Revelation 2:9 and 3:9. Also see the article: “Who Are The Elite And Why Do They Have So Much Power?”. Revelation 2:9 and 3:9 are the churches of Smyrna and Philadelphia, and these are the only two end time churches that JESUS is happy with. They both teach the same thing, which is who cain’s offspring are which say they are Jews and are not, but do lie and are actually of the synagogue of satan. At this point so far, we know that the beast of Revelation 13:1 is satan’s children and that they use Russia as their foot soldiers. The dragon is satan himself. The dragon gives the beast his seat (throne) and great authority. So we know that the beast is satan and his children in control of the one world system, using Russia as it’s feet (which could mean carrying it’s message or enforcing it’s control over the world for any that will abstain from it’s influence). The TRUE Israel will abstain from its influence in the end and that results in The Battle Of HamonGog. 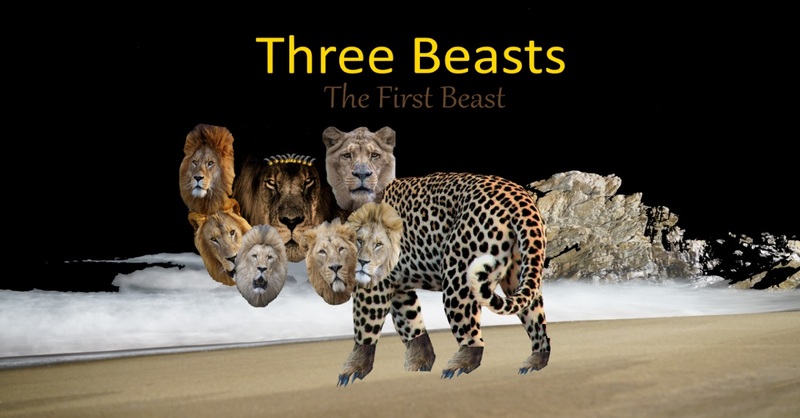 All the world wondered after the beast (which includes multitudes, nations, and tongues). It’s a one world system. The beast does not have all seven heads at once. These heads are the kings of the beast as it is formed over time. Except for one instance where there were two heads at once, or two kings at once (Media/Persia), the beast only has one king or head at a time. The head that gets wounded is the head that is just prior to when satan shows up as antichrist. The devil heals that head (consider the type of wound that would be deadly to a government). For a detailed study on the seven heads of this beast, watch: “Five Are Fallen” - Parts 1 & 2.
Who is able to make war with him? No one, because there is no one to go against him. It’s a one world system. Now notice that this beast has ten horns. A horn is symbolic of power. The interesting thing is that the crowns are on the horns, not on the heads. Notice the power of the horns are given unto the beast? These ten horns are ten kings without kingdoms, but they receive power 'as kings' for one hour with the beast. The hour that is talked about here is the hour of temptation, which is the great tribulation and is also known as Jacob’s Trouble. It’s the time of antiCHRIST and his One World System. Also notice that the crowns are not on the heads. If the crowns were on the heads it would mean that these are actual kings with kingdoms. A kingdom is a king and his dominion. These are not actual kings with dominions though because the crowns are on the horns (meaning it's a political power situation). These horns are given power as kings, but since the crowns are on the horns, they don’t have their own 'home grown' kingdoms. Normally, a kingdom is a family reign where kingship is passed down to the king’s son. Since these ten horns receive no kingdom as yet; but are given power “as kings” for one hour “with” the beast, it means they come with the beast. These are ten fallen angels that get cast out of Heaven with satan in Revelation twelve. They are the iron that is mixed with the miry clay in the ten toes of the image in king Nebuchadnezzar’s dream of Daniel chapter two. See “Five Are Fallen”. The blasphemies are that satan is claiming to be GOD. The time that is given unto him is shortened for the elect’s sake. All prophecies given in nights, moons, or months are related to satan and his fallen ones. Prophecies given in days, solar months, or years are related to GOD and HIS children. Revelation 9:5 And to them it was given that they should not kill them, *but that they should be tormented five months*: and their torment was as the torment of a scorpion, when he striketh a man. The name means the same thing is two languages, so there can be no mistake. The name means “destroyer”, which is the king of the bottomless pit. The king of the bottomless pit is satan. How can he blaspheme the Name of GOD when he is claiming to be GOD? By claiming to be GOD. The way that he overcomes the saints is by killing the two witnesses. This is also what causes the tribulation to be cut short. GOD commanded that those with The Seal Of GOD in their foreheads not be hurt. The two witnesses are saints also and have The Seal Of GOD in their foreheads. Power was given him over ALL kindreds, and tongues, and nations (meaning a one world system). 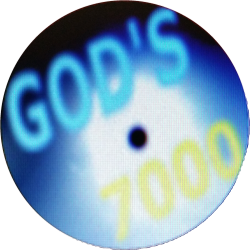 Those whose names ARE written in the book of life of the LAMB from the foundation of the world are the saints, GOD’S 7000, the election. It’s those that have been predestined from the foundation of the world. Take a look at the definition of the word “worship” in Revelation 13:8. It’s pretty bad. Take the time to study GOD’S WORD properly. You know, if you are understanding all of this, that you should be banging on my door to get as much of the knowledge of GOD’S WORD into your forehead as can be and as fast as can be! Or, I should be banging on your door if you have more knowledge than I. The more knowledge we can absorb and the faster we can absorb it the better, because time grows short.